Who should visit THE UK CONCRETE SHOW? Design, manufacture, specifying, site installation, testing, maintaining, repairing….it’s YOUR show! If you have anything to do with concrete, you can’t afford to miss The UK CONCRETE Show 2020 – and to celebrate with us, our 10th Anniversary. The show has grown over the years to be Europe’s largest specialist concrete event and is attended by specialists from all over the world. You’ll see everything that’s new in concrete from all of the biggest names in the industry. 200+ exhibitors expected and over 300 product groups, with everything from cement to pumps, precast manufacturing products, admixtures, reinforcement, testing and repair. DATES – No longer clash with UK half term holidays. HALLS – Halls 17 & 18 at the NEC are absolutely perfect for the Show they really fit the show perfectly, the car parks are now only a short walk away and in 2020 we will be using an outdoor demo arena, perfect for companies to demonstrate their products. No app download required! 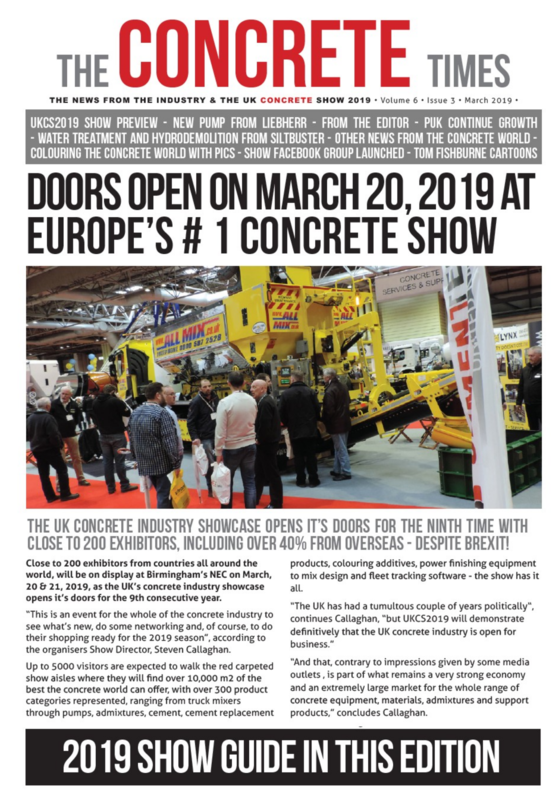 From within your mobile browser, just add www.concreteshow.co.uk to your home screen and with just a single screen tap, check out what’s new at the show. Oh, and don’t forget to follow us on Twitter [email protected] screen to keep on top of all the latest show developments. A printed special show guide edition of our publication, The Concrete Times, will be available in both print and digital online formats. And entry to the show is completely free! To read, CLICK on the cover above.